When a fashion-conscious teenager opts for a 104-year-old product, there must be something special about it. So when my 16-year-old daughter Fiona chose L.L. Bean rainboots, I had to ask her what the appeal was. Instead Fiona lauded the more shoe-like design and fit as compared to the flimsy material and less structured design of common rainboots. This fit made them more comfortable than typical rainboots and less out of place if you wore them on a day when it did not rain. Twice she mentioned how well the boots kept water out and that her feet never got wet in them. The idea of getting them occurred to her because many people already had them at school. Leon Leonwood (L.L.) Bean returned from a hunting trip in 1911 with cold, wet feet and an idea of how to solve the problem of keeping feet warm and dry while in the woods. His innovation was to have a cobbler combine the foot covering of workmen’s rubber boots to leather uppers. The result was the Maine Hunting Shoe® and the birth of his namesake company. Like any entrepreneur, L.L. Bean faced challenges. The leather uppers separated from the rubber bottoms on ninety of his first hundred pairs sold. L.L. Bean had offered a money back guarantee and refunded the ninety pairs. Then he borrowed more money, fixed the problem and continued to market the boots. His dedication to high quality, to customer service and to satisfaction guarantees are values of the L.L. Bean brand that exist to this day. His target market – the outdoorsy crowd – remains the focus of the brand today. And though L.L. 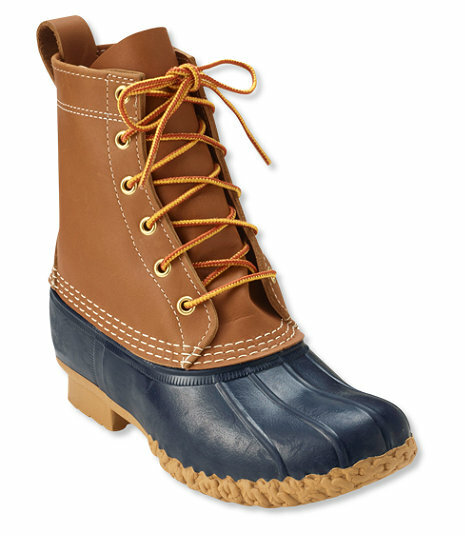 Bean now carries over 140,000 products, the original Maine Hunting Shoe®/Rainboot remains the company’s flagship product. The company sold over 500,000 pairs in 2015. What does it look like when a brand executes its well-defined values, purpose and mission to the fullest extent? You see those tenets in every move the brand makes, not just in external marketing efforts. When Fiona opened the box containing her new rainboots, she found a two-sided card enclosed. One side advised the best way to assess the appropriate boot size. 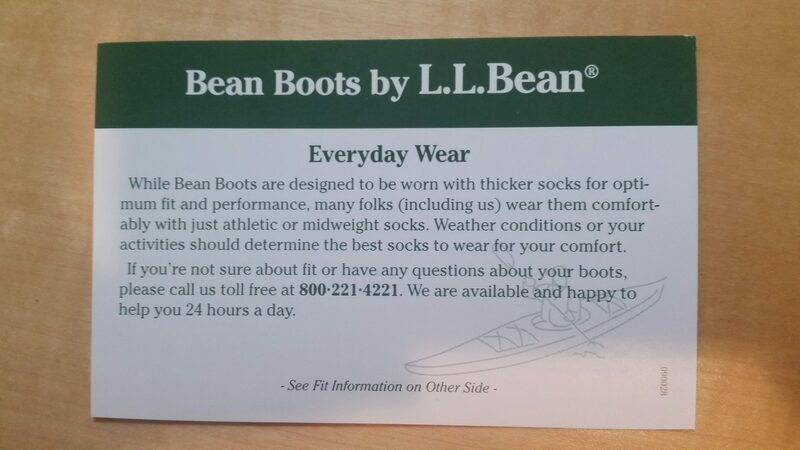 The other side addressed every day wear of the boots and offered the customer service number to answer any questions or get help with the fitting. The card conveyed how important it was to the company that the boots fit well and that the customer get whatever help she needed. It was not an expensive marketing effort, but it reinforced the brand’s dedication to customer satisfaction. L.L. Bean also understands that the audience it serves goes beyond customers. Leon Gorman, L.L. Bean’s grandson, codified this idea by introducing the brand’s “stakeholder concept.” He defined the brand’s stakeholders as customers, employees, stockholders, vendors, communities and the natural environment. The concept declared the purpose of the company to add value to every stakeholder. By stating this explicitly, employees know they are important to the company and can feel part of the brand. Employees’ dedication to the brand comes through in the video “True Quality Takes Time,” posted on some of the boot product pages on the L.L. Bean website as well as on YouTube. Employees talk about their tenure at the company, how they feel about working there and the pride they take in handcrafting the boots. By treating their employees as a key part of their audience and with the same respect they treat all of their partners, thousands of L.L. Bean employees become brand advocates. In keeping with L.L. 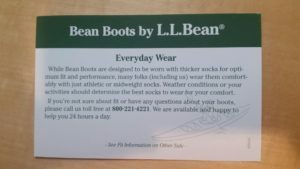 Bean’s mission of “helping people enjoy the outdoors,” the company launched L.L. Bean’s Outdoor Discovery Schools®. The schools are classes offered at every one of the brand’s retail locations. Most classes are free. Over 150,000 people took classes in 2015. The brand’s values, purpose and mission provide a roadmap for everyone from the chairman to customer service representatives on how to act on a daily basis. This is important as life isn’t easy, even when you execute as well as L.L. Bean does. On January 8, 2017 Chairman of the Board Shawn Gorman (great grandson of L.L. Bean) found himself needing to respond to a boycott launched by the group Grab Your Wallet based on Linda Bean’s contributions to the Trump campaign. In his statement, Gorman said that the company’s “owners, employees and customers hold views and embrace causes that are individual and diverse” but are “united in our love for the outdoors and our guiding principles established back in 1912 by Leon Leonwood Bean himself….” On that basis he depicted the company as apolitical. On March 7, 2017 L.L. Bean recalled 3,000 snowshoes because they discovered the plastic could weaken and break. There had been only four failures of the product and no injuries, but the company enacted the recall per their dedication to quality and customer satisfaction. On March 31, 2017 a customer service representative named Michael called me to say that I had two $10 coupons from my L.L. Bean credit card that expired on March 8, but that there was a 30-day grace period and the company did not want me to lose them. He also thanked me for using the L.L. Bean Visa card. The consistent and relentless execution of the L.L. Bean purpose, mission and values grew the company to $1.6 billion in 2015. It also guided their decision-making, investments, operations and marketing. Have you spec’d out your brand’s mission, purpose and values yet? If you haven’t, invest the time. Done well they will set your brand up for long-term success. And you might even get your product to appeal to teenagers!